The Trent Hills Therapy Dog Program is a community-based volunteer service offered by qualified handlers and their dogs. They make regularly scheduled visits with their own dogs at nursing and retirement homes, CMH hospital and schools. 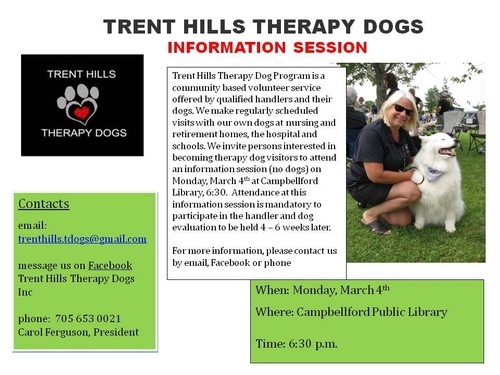 They are inviting persons from our area interested in becoming therapy dog visitors to attend an information session (no dogs) on Monday, March 4th at Campbellford Public Library, 6:30pm. Attendance at this Information Session is mandatory to participate in the handler and dog evaluation to be held 4 – 6 weeks later.